A panorama that spans across the ocean, mountains, and lush vegetation in Samui’s Taling Ngam Beach, Samui Ridgeway Villa is a luxury spa retreat for the tired traveler looking for a break from monotony. With six bedrooms, including spa suites and an individual spa room, the villa offers utmost luxury in relaxation and comfort. 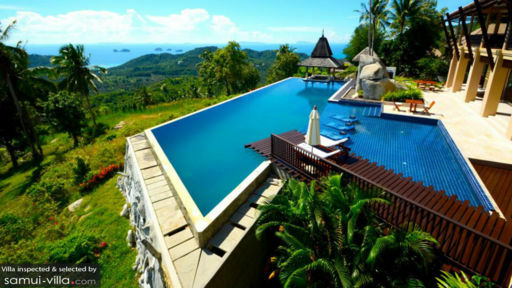 An infinity swimming pool resides right at the edge of the cliff overlooking the scenic beauty of the island! The villa makes rooms for family and friends as there are several living and dining options available to guests! Samui Ridgeway Luxury Villa and Spa offers six, well-furnished and air-conditioned bedrooms that are spacious and even offer much-needed privacy to guests. With five bedroom suites and one guest villa, the bedrooms are furnished with double beds, large windows or doors leading to a balcony that provide a gorgeous view. The Spa Villa is located next to the individual spa pavilion, offering easy access to a tranquil time. Coral and Beige bedroom suites are connected via a doorway to make for a convenient family suite for guests traveling with children! A master suite is furnished with a king-sized, canopied bed, and also provides access to a balcony! The final two bedrooms are the Blue and Purple Spa suites that are equally spacious and comfortable. The spa suites have elements of an actual spa within their walls including massage beds in the en-suite bathrooms perfect for a water massage. Each of the six bedrooms has an en-suite bathroom with modern amenities. A view that includes towering palm trees swaying above the ocean where they meet the blue sky greets you as you lie back and relax on the timber pool deck at Samui Ridgeway Villa. The infinity swimming pool is freeform and allows you the chance to sit back and take in the beautiful view of the beach. 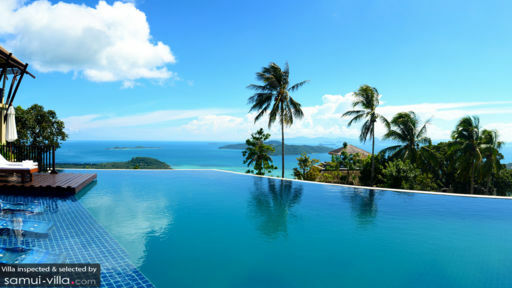 Pre-installed pool beds can be found in the shallow part, to take in the stunning vista in front of you. There are sun chairs placed under large parasols to keep you in the shade unless you wish to sunbathe under the tropical sun. A sunken lounge area is right at the tip of the mountain beside the pool, a great place to be in during the evening once the sun sets. The poolside living area at Samui Ridgeway Villa is a contemporary space marked with traditional Thai elements reflected in its interiors. There is a plush and comfortable sitting area with sofas, armchairs, coffee tables all sat facing a projector screen for exciting movie nights! The hardwood flooring adds a bit of opulence to the already elegant space creating a welcoming and cheerful ambiance. For lounging, you will find that there are several seating areas provided around the villa, for resting and napping. 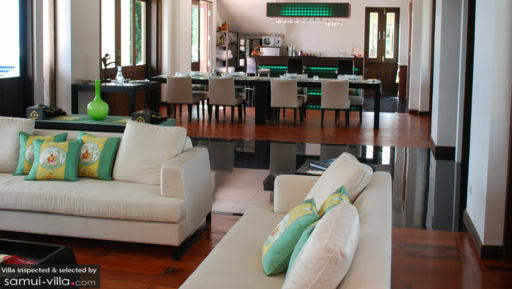 The villa offers two dining areas for the guests, including a ten-seater and a six-seater dining table found in the living room. Everyone can hope to enjoy a delicious and heartily-prepared meal served fresh for a wonderful evening. The view outdoors really is the finishing touch to what will prove to be one of the best holidays of your life. There is an array of services on offer for guests of Samui Ridgeway Villa including endless spa therapies and massages on request, a multi-purpose gym with a splendid view of the tropical vegetation, and a staff who will willingly cater to your requirements. Housekeeping and maintenance is taken care of so all you need to do is have a good time! For meal preparations, transport, etc. you can make requests to the staff. Found atop a mountain in Taling Ngam, the villa is at a prime location for a rejuvenating holiday. Roam around town to explore the lifestyle of the locals in this area, and head to the beach for a fun day out with the sun, sand, and water. Enjoy a delicious French meal at La Paillote, prepared by a French couple residing in Samui!